Disclaimer: Long range outlooks continue to be a work in progress, and although our understanding of meteorological processes has grown, the nonlinear, chaotic nature of weather makes this task a very difficult one. With that being said, I will provide meteorological reasoning for what I believe the upcoming winter’s patterns will be! I will be utilizing the above abbreviations of teleconnection indices throughout the outlook. These variables reflect the atmospheric circulation patterns for certain geographical areas. The AO refers to patterns within the Arctic circle, the NAO in the north Atlantic, the PNA in the western part of North America, and the EPO in the northern/eastern Pacific, Alaska and western Canada. If you are a cold / snow lover in the Eastern US, you generally want to see the above indices in their negative phase, except for the PNA, which is more favorable in its positive phase for Eastern cold. Negative AO, NAO, and EPO generally correlate to enhanced blocking and high pressure to our north, and to balance it out, low pressure and troughs usually form underneath in the middle latitudes (our area). In contrast, positive AO, NAO, and EPO generally yield low pressure and less blocking to our north, and as a balance, we experience high pressure and more ridging. There are exceptions to the rules, but most of the time, if you like cold / snow, the preferred index phases are negative AO, NAO, EPO, and positive PNA. The current SSTA profile globally illustrates a few important signals to note. A)The water temperatures in the central, tropical Pacific are close to neutral, with the eastern tropical Pacific generally slightly colder than the central and western tropical Pacific. Since we have no El Nino or La Nina, the differences between the various ENSO regions are not as noticeable, but there is significance to the fact that the western ENSO regions are slightly warmer. This means that tropical forcing, specifically Madden-Julian Oscillation (MJO) associated waves of upward motion can propagate further east than they normally would in colder ENSO regimes. In turn, the tropical forcing for the upcoming cold season should be more conducive to the development of a north Pacific high pressure with low pressure to the north of the Hawaiian Islands. ENSO models continue to forecast a predominately neutral picture for SST’s in the tropical Pacific. Southern Oscillation Index (SOI) values have been near neutral to slightly negative over recent weeks which suggests no significant atmospheric pressure changes in the tropics, and thus, no rapid onset of La Nina or El Nino conditions. B)Notice the warmer SST’s in the northern Pacific, Gulf of Alaska, and west of the Western USA coastline. This in indicative of a pattern that has been in place much of the autumn – one in which high pressure has dominated. The prevalence of a warm pool in the Gulf of Alaska can create a positive feedback cycle as the dominating air pressure pattern produces the warm SSTA, and the warm SSTA helps to maintain that air pressure pattern. This feedback cycle should continue overall this cold season. C)Warm water in the Atlantic – this is suggestive of the continued positive / warm phase of the AMO. Note in particular the very warm water in the north-central Atlantic, as this has been the SSTA signature for most of the past year. Persistent features can sometimes be indicators of the large scale atmospheric pattern, and could potentially be reflective of the NAO regime, which will be discussed later. While all teleconnection indices are quite important and are valuable puzzle pieces, I’m discussing the EPO second because I believe it to be a very influential variable in the upcoming winter’s pattern. While the NAO and AO are often talked about as we see the infamous “Greenland block” referenced by media during many of our snowstorms, the EPO is generally an underemphasized, under-rated variable. Believe it or not, the EPO generally has the highest correlation to temperatures across the northern tier of the United States during the winter season, and so accurately forecasting its dominant mode can be extremely helpful. The negative EPO and its associated higher than normal heights across Alaska / North Pacific have been present over the past several months. The November 1st-November 17th 2013 500mb height anomaly map for the northern hemisphere suggests that the negative EPO continues to persist. Notice the positive height anomaly in the northeast Pacific, near the Aleutians / Alaska indicative of the negative EPO regime. Negative height anomalies dominate the Arctic and North Atlantic, suggesting the presence of the strongly positive AO and NAO patterns. Higher than normal heights in the EPO region of Alaska and the north Pacific are very important for the following reason: The higher than normal pressures that build as a consequence of this negative EPO can transport bitterly cold Siberian air across the north pole and southward into North America. This is because the clockwise circulation around high pressure centered in Alaska drives east Siberian air into NW Canada, so that we have a nearby source region of arctic air. If we remember the past couple winters, Alaska was very cold and snowy due to the prevalence of low pressure (a positive EPO pattern). For much of the United States, we’d prefer Alaska to be warmer than normal and under the influence of high pressure in order to set the stage for colder patterns for us. Let’s take a look at the composite of 500mb patterns for the Novembers preceding our warm winters of the past couple decades. On this list are some of our classic torch winters, including 2006-07, 2011-12, and years in the late 80s/early 90s. 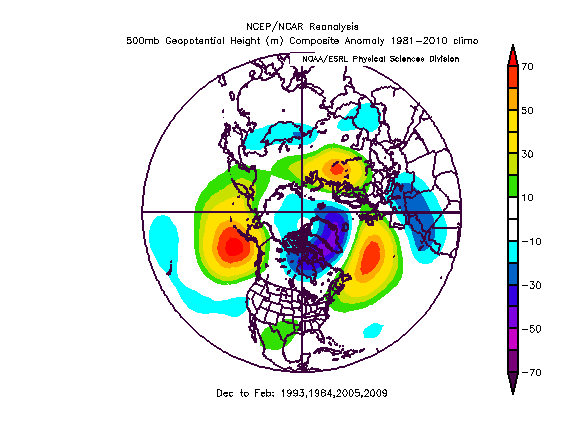 Along with the positive AO and NAO, the EPO tended to be positive as low height anomalies dominated the Alaska/British Columbia/Northeast Pacific geographical region. Now let’s examine the 500mb composite of Novembers preceding our generally colder winters of the past couple decades. One of the major differences to notice is the strong positive height anomaly near Alaska, indicative of the negative EPO signal. So the point here is that most of our colder winters usually had a negative EPO preceding them in the month of November. 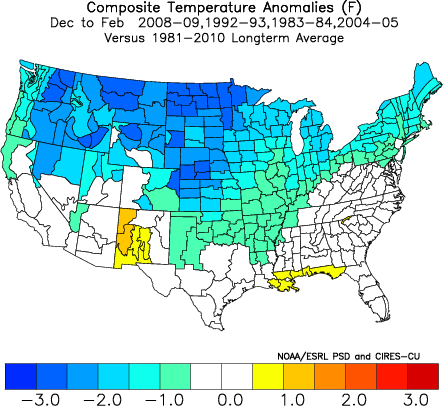 Most of the warmer winters featured a positive EPO in the November prior to them. The exact statistics are as follows. 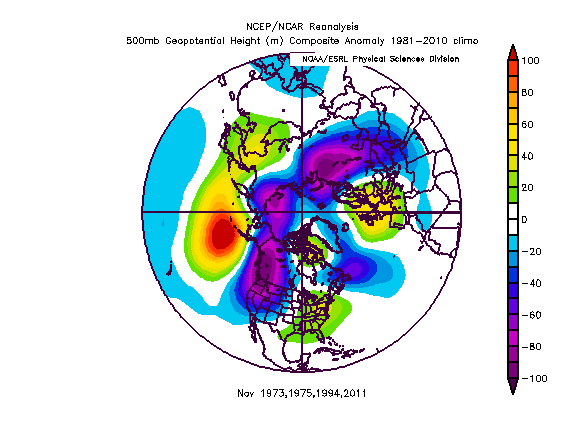 Since 1950, the EPO state of November has predicted the winter (DJF) overall EPO modality approximately 75% of the time. If we examine the 21 neutral ENSO winters since 1950, 17 of those winters had the same overall EPO state as the Novembers prior to them. Thus the EPO state (negative or positive) in November is POSITIVELY CORRELATED with the EPO state for DJF, meaning a positive EPO pattern in November usually continues for the winter and a negative EPO pattern in November usually persists for the winter. 81% of neutral ENSO winters since 1950 saw this EPO correlation work. It is for these reasons I anticipate a negative EPO overall for winter, more similar to the above composite of colder years for the US than the warmer ones. The November NAO modality has shown to be a helpful guide in determining the ensuing winter’s NAO. Since 1950, 67% of years had the same NAO phase for the DJF average as they did for the November preceding the winters. 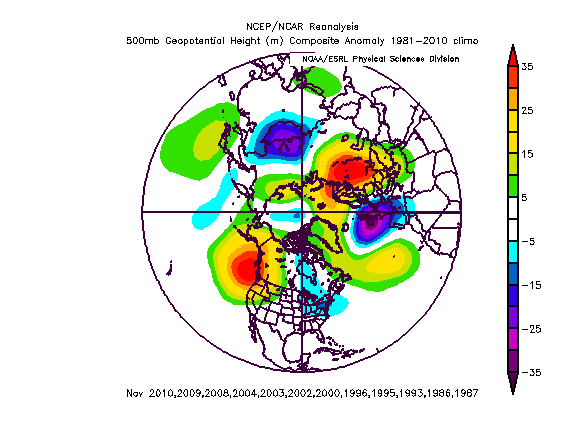 Like the EPO, the NAO pattern of November is strongly positively correlated to the regime of the winter. Ensemble guidance for the NAO over the next couple weeks generally keeps values neutral to slightly positive. There were some hints of potential blocking for early December, but those have since dissipated. If the November NAO state were to continue into December, the statistics are as follows. December NAO mode predicts the DJF-Winter NAO mode 79% of the time. If we isolate the neutral ENSO winters, that correlation is slightly stronger. In other words, the maintenance of a neutral to positive NAO into early December only bolsters the November correlation for a positive NAO overall. We can draw further evidence for our winter NAO from the Atlantic SSTA pattern during the warm season. The warm season SSTA profile in the Atlantic has shown to provide a strong clue for the upcoming winter overall NAO pattern. Generally, when the warm season SST’s in the north Atlantic are above normal, a positive mode of the NAO follows. When the warm season SST’s in the central Atlantic are below normal, usually a negative mode of the NAO follows. Since 1950, the Atlantic SSTA correlation has worked 46/62 or 74% of the time. When we examine the 21 neutral ENSO seasons since 1950, the correlation worked 17/22, or 81% of the time. This is likely because the El Nino or La Nina signals can often override the relationship between the Atlantic SSTA profile and the NAO. For the upcoming winter, since neutral ENSO is in place, the Atlantic SSTA correlation is stronger than it usually is. Given the Atlantic SSTA pattern for the past warm season, and the other correlations drawn, my expectation is a dominant positive NAO signal for DJF. Like the other teleconnection indices, November’s pattern can offer significant clues. Since 1950, the November AO mode foretold the DJF AO mode 67% of the time. The December AO modality foretold the DJF average AO 86% of the time. We have seen a strongly positive AO so far in November, meaning very low heights across the Arctic circle with a dominance of low pressure. Ensembles forecast the maintenance of the positive AO regime into early December, with the possibility of approaching neutral at times. However, the correlations convey to us that a positive AO persisting from Nov into December generally means the AO averages positive for DJF. The stratosphere is another helpful tool for AO prediction. Colder temperature anomalies in November generally mean a stronger stratospheric vortex and thus a tendency for a stronger tropospheric vortex (positive AO). The opposite occurs with a warmer stratosphere. Some of our best blocking occurs in conjunction or after the development of a very warm stratosphere. So far in November, stratospheric temperature anomalies at 70mb have been colder than normal. This supports a generally positive AO at least for the front part of winter. Thirdly, the snow-advance index (SAI) in October is a good predictor of the wintertime AO. Essentially, the faster snow cover progresses southward in the month of October, the better the chance we have of negative AO/blocking for the winter. This October, the snow advance progressed slowly. We started with a high snowfall accumulation in early October but that rate of snowfall advance decreased rapidly throughout the rest of October. Therefore, the SAI predicts a positive AO winter. 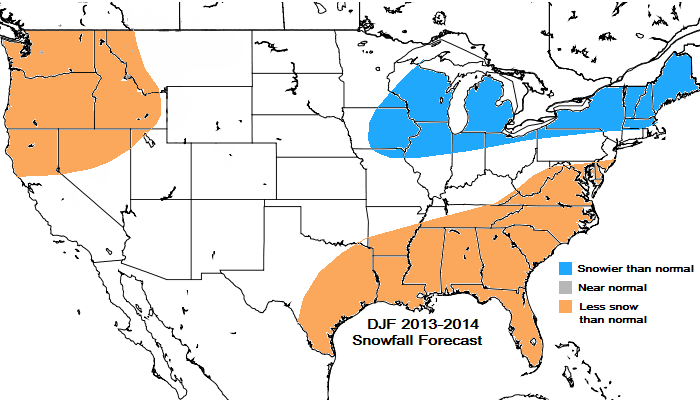 As such, my expectation is a positive AO winter (DJF) overall. The PNA is highly correlated to PDO values, that is, when the PDO is positive (generally warmer than normal water in Eastern Pacific) the PNA is usually positive. When the PDO is negative (colder than normal water in the Eastern Pacific) the PNA is generally negative as well. In fact, whenever the PDO is -1.0 or lower, the PNA was negative 14/17 cases since 1950 or 82% of the time. Thus, the more strongly negative the PDO is, the more likely the PNA will also be negative. This year’s PDO values have been predominately negative to very negative with October 2013’s PDO value of around -0.9, slightly warmer than -1.0. The PDO suggests a negative PNA overall. The major caveat here is the water profile in the north Pacific, which continues to be warmer than normal. This signal tends to be present more often in positive PNA seasons. The atmospheric pattern of ridging near the West Coast yields warmer water which can feedback and promote more ridging. As a result, the PNA should see periods of positive values and periods of negative this winter, averaging out near neutral. 1993-94 was an initial analog due to similarities in the EPO and NAO expected regimes, but that winter featured a very severe / southward displaced Polar Vortex, making it difficult to include. The four analog years listed above featured an overall positive AO, neutral to positive NAO, negative EPO, and an oscillating PNA regime. 1983-84 was weak La Nina, 1992-93 was neutral ENSO, 2004-05 was weak El Nino, and 2008-09 was weak La Nina. So the summation ENSO signal for these analog years was around neutral, with the global indices signals that I am expecting for the ensuing winter. Analogs are tools and meant to be utilized as guidance for the current pattern. 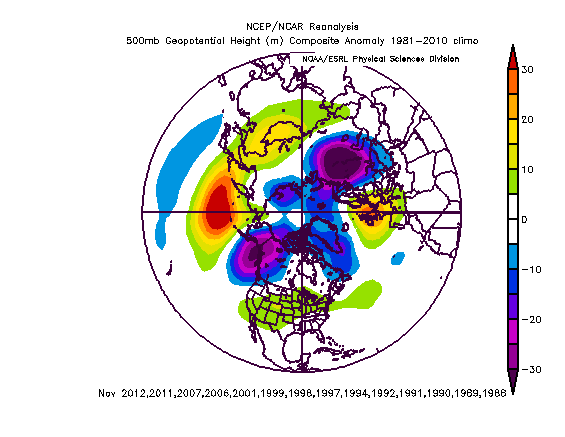 Note the negative EPO ridge in the north Pacific, positive AO/NAO with low heights around the Arctic, and a SE ridge. It was mentioned earlier that November’s AO values were very strongly positive, in fact, above +3 standard deviations. Let’s look at the 500mb pattern for the handful of years with AO values that had daily values of > +3. Those years were 1973, 1975, 1994, and 2011. The winters following these Novembers were very warm across most of the US, as most of us remember (or try to forget) the winter of 2011-12 on this list. The feature to note on the above 500mb map is the area near Alaska and British Columbia. Very low heights via the positive EPO pattern which was NOT present this November. 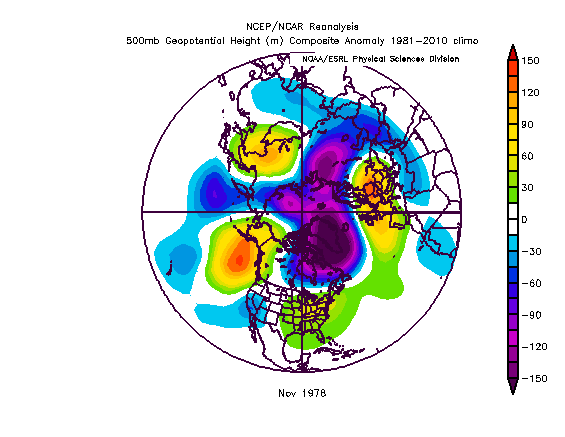 This November’s pattern was actually more similar to 1978, a year with +3 AO values but a reversal to a cold winter for much of the United States. The takeaway here is that this November 2013 does not look similar to the Novembers which led to blowtorch winters across the Eastern US. Winter’s dominant pattern should feature a +NAO, +AO, -EPO, and averaging neutral PNA. This regime should be able to drive arctic air from Siberia into North America even considering the +AO and +NAO pattern. The EPO/Alaskan block may act to prevent maritime Pacific air from blowtorching the US for the majority of the winter. On the Atlantic side, a +NAO should promote a SE-ridge in the Eastern US, causing a lot of back and forth temperature wise. The overall ridge/trough synoptic set up favors the coldest temperatures relative to normal in the Central US/Mid-west, with moderation towards the West and East Coasts of the US. The winter should feature more strong arctic shots than recent winters due to the negative EPO. Think back to 2008-09 when warm spells were interspersed with very cold air, and January 2009 was bitterly cold. There is a good chance for a one month period of cold/very cold weather in the Eastern US. 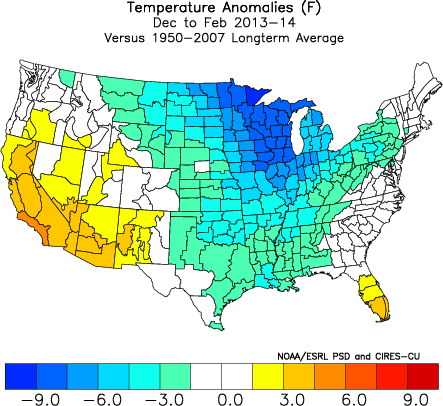 All 4 analog years featured one month of very cold temperatures. 3 out of 4 years had January as that month (1983-84, 2004-05, 2008-09) and 1 out of 4 had it in February (1992-93). I am not forecasting the timing of the coldest period, but if the analogs are correct, the heart of winter could be quite cold. 1992-93, even with a DJF AO of +1.7 (strongly positive) finished slightly colder than normal in the Northeast corridor due to one month of strong cold. The SE ridge due to +AO/NAO means a warm to very warm period(s) are quite likely. 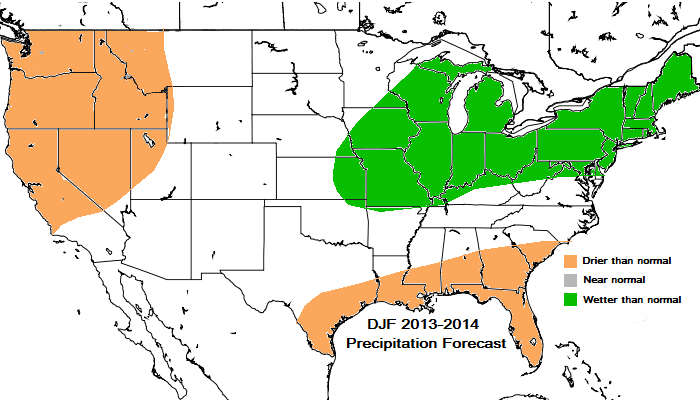 Precipitation wise, there’s nowhere to go but up after this extremely dry autumn in the Northeast. 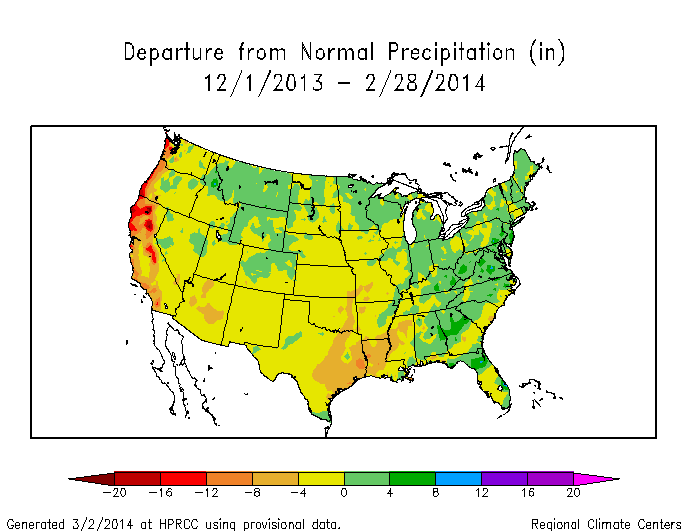 Precipitation should increase and most record dry falls are followed by a wetter than normal pattern in the winter. The positive SSTA anomalies to the east of New England argue for increased baroclinicity and storminess once the arctic airmasses begin pressing up along the East Coast. This should be an interesting winter with plenty of arctic air on the map, and a massive fight going on between warm and cold in the East. It was similar to the analog package with the mean trough centered near the Mid-west, and ridges along both the West and East Coasts of the USA. The expectation for an overall positive NAO, positive AO, near neutral PNA, and negative EPO, generally verified very well. The negative EPO provided a one month period of very cold weather on the East Coast from about Jan 20th-Feb 20th. The flaw in the forecast was that the center of the cold anomalies, as predicted to be in the northern Plains, was slightly further east, near the Western Lakes. This meant the entire pattern (ridge/trough orientation) was slightly east of forecast, and so the baroclinic zone generally aligned itself just east of the I-95 corridor rather than along it. The subtle difference at H5 resulted in meaningful differences at the surface, as the I-95 corridor ended up being colder and snowier than I anticipated. With that being said, the expectation of significant moderation in temps toward the east and west coasts compared to the Mid-west was correct. The record cold was confined to the Lakes/Mid-west. Precipitation ended up similar to forecast, with drier than normal conditions for the West and much of the South, while wetter than normal prevailed from the Lakes into the Mid Atlantic and Northeast. In summation, this winter’s forecast went well in the overall sense in my opinion, with the teleconnection outlooks verifying (-EPO, +NAO, +AO, etc). The NYC metro area generally finished with slightly colder than normal DJF period, as per the temperature departure map above. This was slightly colder than expected. Snowfall is always the most difficult factor and will be weighted lighted, but it was much snowier than anticipated for the immediate east coast. The expected heavy snows for the interior Northeast aligned near I-95 frequently. 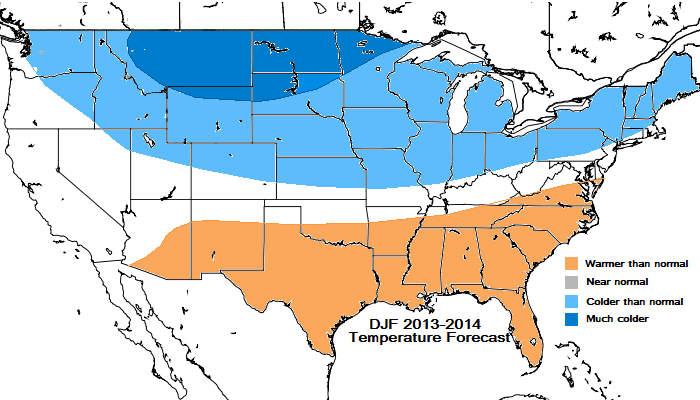 My assessment of this winter’s outlook, 2013-14, is a grade of B/B- overall.